Congrats! Wallace-l has been a great place to hang out over the past 20 years. I’ve learned from and argued with too many of you. You guys were my Cheers. When I signed up to Wallace-l, I was a production manager at Natural History Magazine. 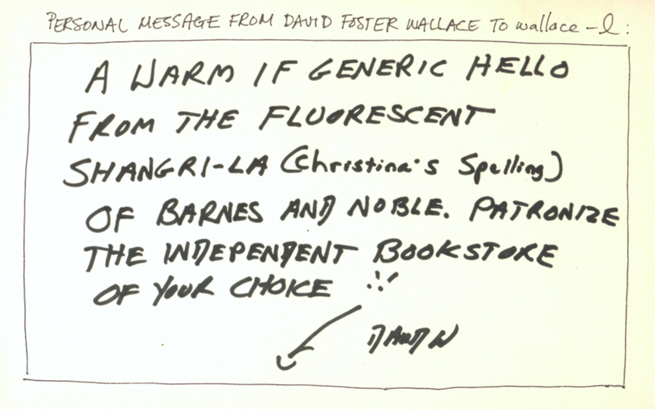 It’s possible that talking about Wallace all day every day is what made me steer my ship towards Little, Brown so I could work with DFW. And I did. Remember my post-modern inaction figures? They’re still in my closet (except for the Mark Leyner–I gave him his and it’s probably collecting dust at a Hoboken Goodwill). Anyways, I have warm and fuzzy feelings for all of you. And I still think the urban legends are a majorly important component of IJ. My sentiments exactly – I love this list! I’m not sure exactly when I started mostly lurking in the wallace-l group, but it was years before the day I saw my email blow up with the heartbreaking news. I was glad to have some connection with others who loved his work, and continue to enjoy their discussions.